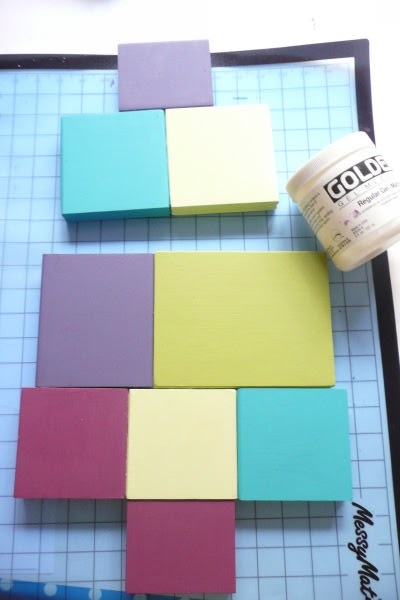 Hi everyone, Lucy from True Colours here, joining you this evening with a post about using the wooden blocks from old rubber stamps to make a colour block Christmas Tree for a home decor piece. Abstract art means different things to different people, and as I will always think of myself as a crafter and not an artist, I am not the best person to ask for a proper definition! But it made me think of representing things in an untypical way or in colours in which they would not appear in nature. It also made me think of linear designs and blocks of strong colour. So I stuck to squares and straight lines for my tree, and although I chose iconic Christmas imagery such as holly and snowflakes, I didn't use traditional colours. I love the old wooden stamp blocks but they take up much more space than unmounted ones, and are harder to line up when stamping. It's easy to remove the stamp by melting the glue with just a few seconds in the microwave and if you still want the stamp itself, you can still keep it. It would be such a shame to throw out those gorgeous chunks of wood though! Step One: The preparation of the blocks takes a while, so stick the radio on, or have your friends round for a natter. After you have removed the stamp you will have a sticky residue. I removed this with isopropyl alcohol bp from the chemist (use in a well ventilated room). On the reverse of the stamp there will be a printed image which will either be directly on the wood, in which case it can easily be sanded off, or on a sticky peel off label. More sticky residue! 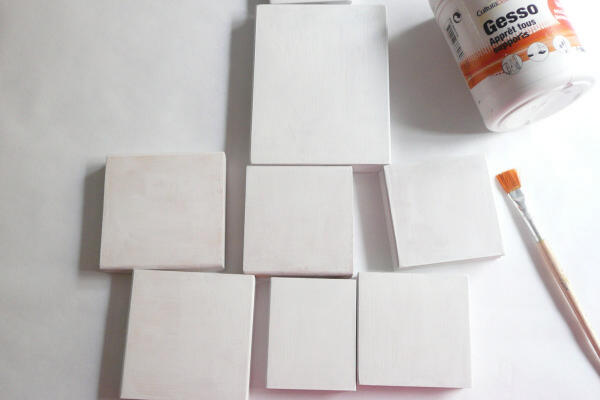 Thoroughly sand the blocks and gesso. 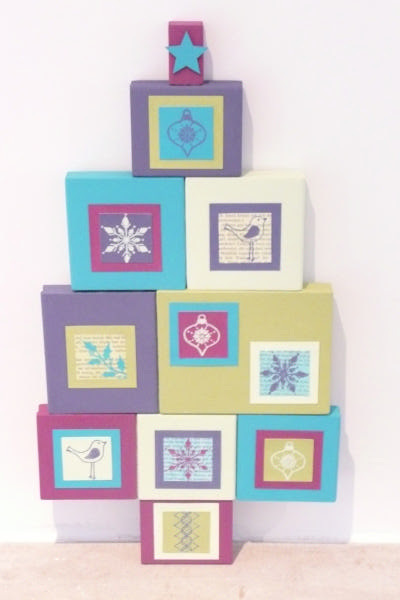 Step Two: Paint the blocks with each of the colours from the new Limited Edition Fresco Finish Paints, which are available from your local PaperArtsy Retailer and contain Professor Plum, Captain Peacock, Teresa Green, and Granny Smith. 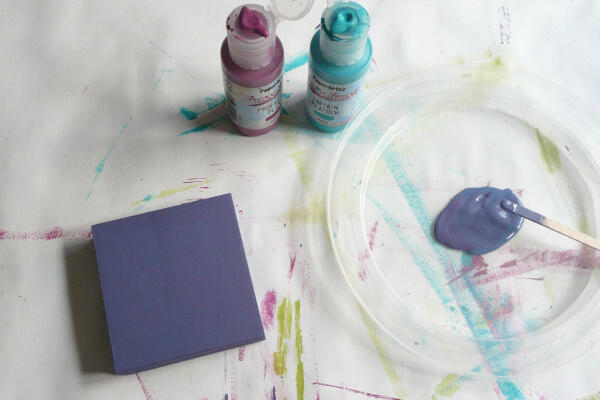 Create a fifth colour by combining Captain Peacock and Professor Plum so that you have a lovely bluey mauve. 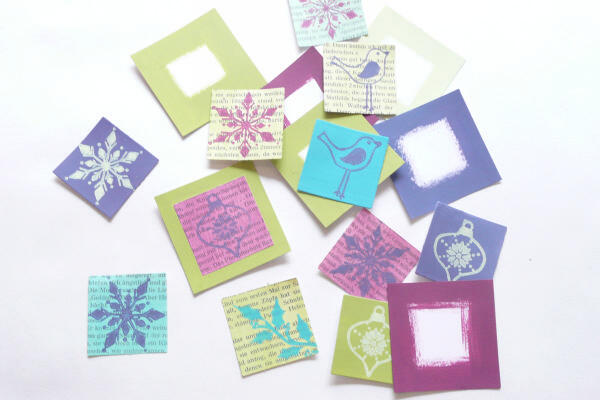 Whilst you're doing this, you also want to have some cardstock prepared in each of your five colours, and some book text with a wash of each colour on it for your stamped images. Step Three: Arrange your blocks, alternating the colours, so that they start to resemble the shape of a tree with the bottom one being your pot. (There's going to be a little Professor Plum block at the top). Start to glue them together with Golden Gel Medium. This is really good and strong but it's a good idea to plan this stage so you can leave it overnight to set up. 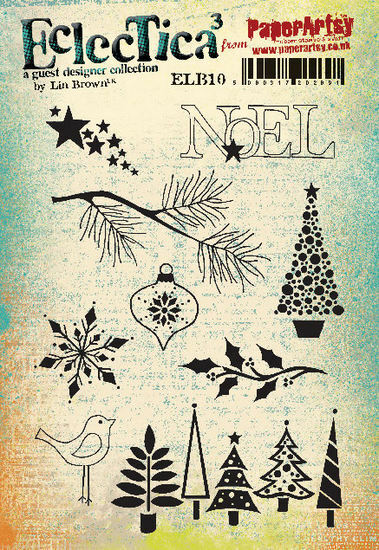 Step Four: Stamp a really good selection of images from Eclectica ELB10 onto the prepared cardstock and booktext using each of the paint colours so you have plenty to choose from when you eventually put the design together. You can use any leftovers for Christmas cards. 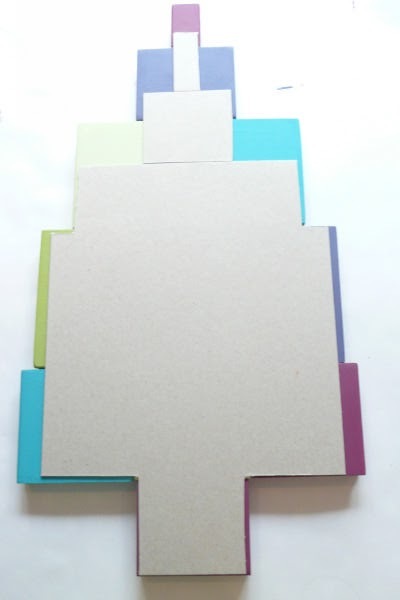 Save the remaining painted cardstock to cut into squares to act as a border for each of the images. 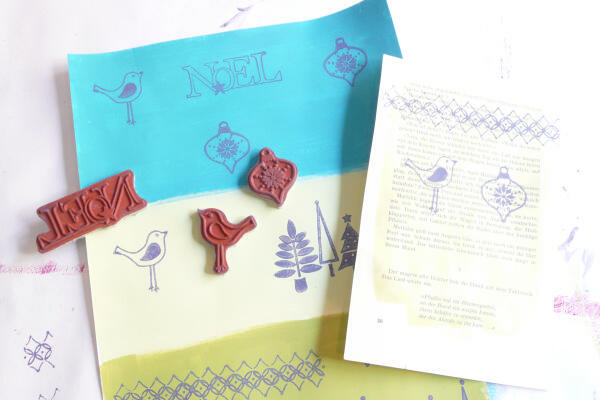 I have also used the border stamp from ELB23 which is really beautiful, which is on the pot of the Christmas tree to differentiate it from the tree decorations. 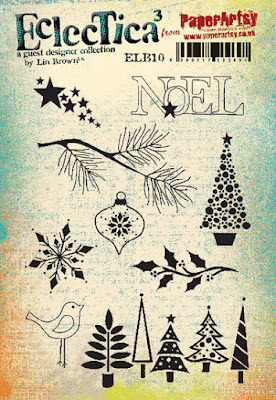 (In the end I didn't use Noel and the Trees which are stamped here). Step Five: Reinforce the structure of your tree by turning it over and cutting a piece of chipboard to fit and gluing it on, concentrating on the joins. 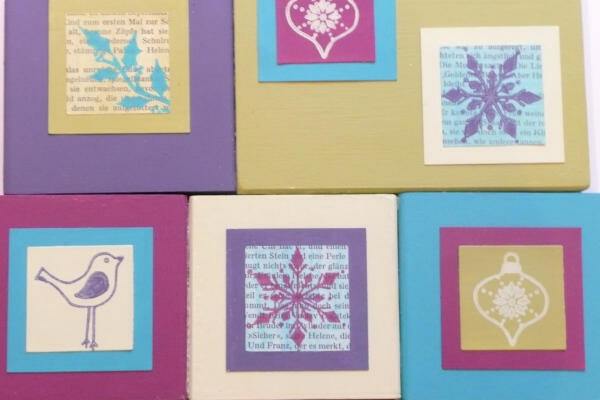 Step Six: Die cut your chosen images into squares, with a slightly larger square in a contrasting colour for your background. Glue together and then arrange and glue to your tree in a pleasing composition. To finish, paint a chipboard star with Captain Peacock and glue to the topmost block. This project was a little outside my comfort zone as I don't think my normal style is particularly abstract but it was good to challenge myself, and, when it comes to Christmas, my taste is a little non-traditional. I was surprised how well the tree looked on my mantelpiece against my plain white wall, although I am probably the first in the street to have decorations up! I really enjoyed using the wooden blocks and can think of plenty more projects using them, so I hope you can build on this idea! This is so clever, Lucy, and I love the colours of course! Now if I could only bear to unmount my stamps!! Love your great retro colours and fabulously chunky tree. Great idea, Lucy & I love the finished tree, it's very funky. What a gorgeous project, Lucy. I would never have thought of doing this and a great interpretation of 'abstract'. I too consider myself a crafter who loves paint and not an artist. Love the yummy colours and the whole effect. Gosh Lucy, thanks for a great process post with so much detail. Great result, really unusual and modern. Brilliant idea Lucy, I love it. So many possibilities with this idea but have to say I love your use of colour and the overall clean design.